We are in the second quarter of 2018 and deal data is now available through the end of the first quarter. In this report, we review our region’s most active industry sectors and give an outlook for 2018.
acquisitions for 2018, but there are outside drivers likely to impact aerospace M&A this year. There are concerns about potential disruption to industrial supply chains with recent trade policy turbulence. Tightening monetary policy underscores the benefit of a strong cash position, which the sector has experienced over the last several quarters. Liquidity will also increase with the lower corporate tax rates recently introduced. General Dynamics’ acquisition of CSRA accounted for 64% of Q1 deal value this past quarter. The Software and Security Systems category accounts for the majority of sub-sector deal value as acquirers seek scale, synergies, and cost-effective IT solutions and services for defense, intelligence communities, and government civilian agencies. chemicals sector M&A activity: tax changes, NAFTA implications and the consequences of larger company consolidations. Conflicts arising from recent tariffs and the uncertainty with NAFTA could lead to increased M&A activity as companies seek to repair potential supply chain disruption. Several regulatory ordered divestitures are likely to follow consolidation among chemical majors, contributing to M&A transaction value and volume this year. Due Carlyle Group acquisition of AkzoNobel’s Specialty Chemicals business, the Specialty Chemicals category accounted for 92% of chemicals deal value. 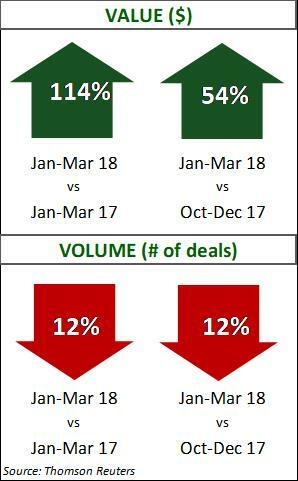 Broader activity in this sub-sector also contributed to 52% of deal volume. The construction and engineering sector’s underlying fundamentals are positive as investment continues in housing and infrastructure. Construction Materials Manufacturing owned the bulk of deal value this quarter, while deal volume is led by Construction and Civil Engineering. Any tailwinds developed by tax reform may be subdued by trade policy disputes and recent tariff announcements. Even with continuing trade agreement discussions and potential trade conflicts, the outlook for the North American market is positive. Rising energy prices have created renewed outside interest in the oil and gas sector. 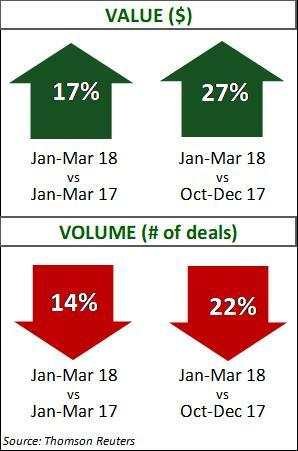 Within the sector, increased deal activity is expected in 2018, but primarily smaller deals. Oil and gas companies have been transitioning to a model with less risk; emphasizing capital discipline and working within existing cash flows. Divestiture of non-core assets will likely result. Driven by shale deal activity, upstream deal value increased 76% from the prior quarter. Analysts expect to see continuing shale-related deals as companies look for opportunities where they already have expertise and scale. Midstream volumes were up compared to last quarter and year over year, however values were down. Downstream and oilfield services experienced a decrease in volume and value. 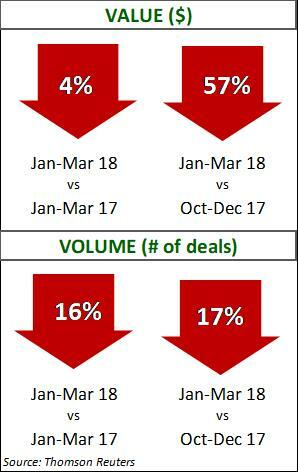 Healthcare M&A transactions exceeded 200 deals for the fourteenth quarter in a row, despite declines over prior quarter and prior year. Disruption and potential systemic changes to healthcare were topics this quarter with the collaboration between Amazon, JP Morgan Chase, and Berkshire Hathaway. Cigna’s acquisition of Express Scripts accounted for 92% of deal value this quarter. This vertical integration resulted in the Other Services sub-sector as the leader in deal value; however, the Hospitals sub-sector also had significant value growth this quarter. Long-term Care continues to lead transaction volume, while Managed Care and Hospitals increased in volume, 50% and 20%, respectively. 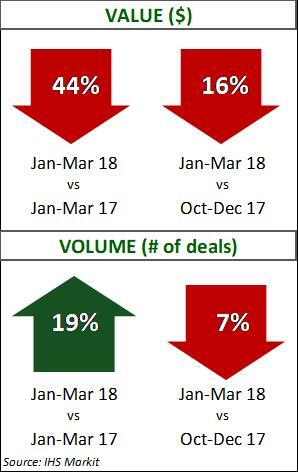 Industrial Manufacturing volume and value of deals were down, but deal drivers are strong for greater deal activity in this sector this year. Divestitures of non-core divisions among larger industrials will benefit from a lower tax cost, increasing the supply of assets on the market. The lower tax rates also increase available liquidity for M&A transactions. M&A activity continues to be influenced by the fast pace of technology and the need to digitize to maintain relevance. While Industrial Machinery led the sector in deal volume, the Electronic and Electrical Equipment category and Rubber and Plastic Products led the deal value this quarter. 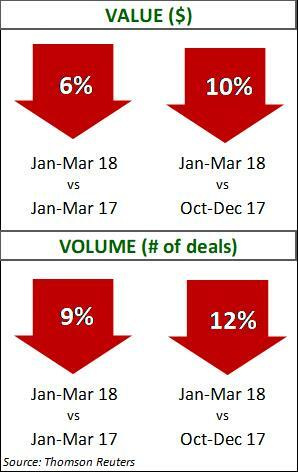 The sector experienced its highest quarterly deal value in three years, however the number of deals declined. 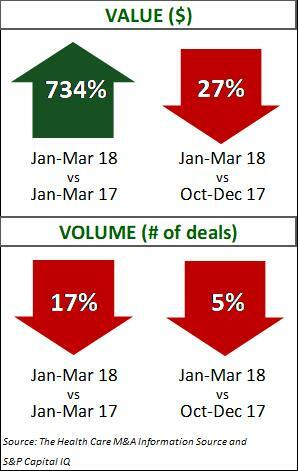 To explain the drop in volume, analysts point to the reduction of Shipping deals as the subsector slows in activity after much consolidation the last several quarters. 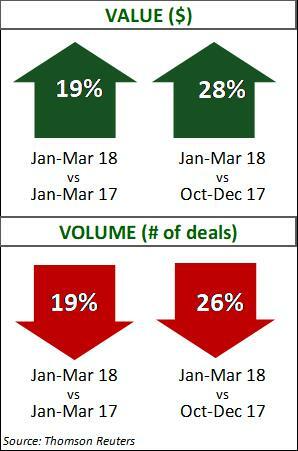 Passenger Air accounted for the highest percentage of deal volume at 26%, with Passenger Ground a close second with 21% of total deal volume. As one Passenger Ground category megadeal represented the largest deal in five years, analysts expect the upcoming quarterly transaction values to be steady, but at a lower level.